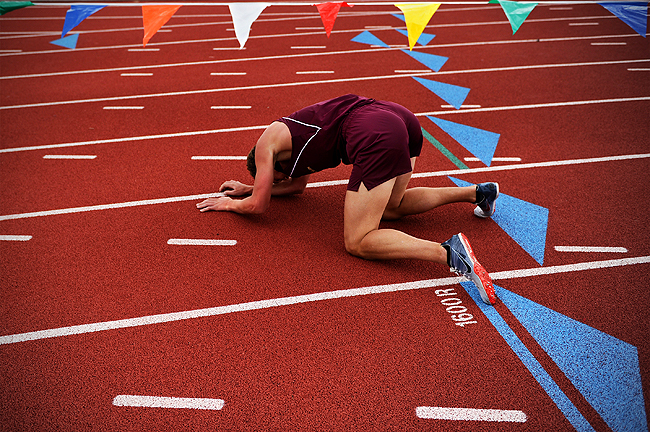 "Holden Adams of Maple Mountain struggles to stay on his feet as he crosses the finish line after running a 3200 meter race during the Prep Region 8 track meet at Maple Mountain High School, Wednesday, May 5, 2010. Adams finished fourth with a time of 10:24." I'm only a week into May and I've shot more sports this past week than I did all of April. I cannot complain though, I love it. This week, I shot some more track and field. This time instead of a couple hours shooting, it was my second of four assignments and I had less than an hour to produce. I should preface, my four assignment day last week was long and exhausting. But I totally miss that hectic, chaotic life I once had when interning and freelancing at a major metro. Multiple deadlines throughout the day, transmitting on the go, hectic, multiple assignment days, traveling around the Baltimore-Washington corridor. It was what I thought things would always be like. While things are still busy, and hectic at times, it's nowhere near like it used to be. It's not much of a rush as I remembered. Now I have one deadline at the end of the night, two to three assignments on average and travel is basically non-existent outside of Utah County. So when I saw the budget last Wednesday I was excited to have the day I was going to have. I would have to work fast, produce compelling images and then quickly move onto the next assignment. The day was long, yet fun. While I decided there was no need to transmit from the field, I did end up toning, captioning and dumping 25 images in 35 minutes from my four assignment, all before deadline. I did however: miss two meals, get covered in sand, listen to an entire arena echo of screaming children for more than an hour, chase down a subject for their name, get home late, and then had up early the next day to do it all again. But I wouldn't trade it for anything - It was a great day.